We were looking at what affects your house price for last week's Finance Fridays. This week we are looking at switching bank accounts. Many people will stay with the same bank for their entire lives whilst others will switch banks when it suits. One thing that puts people off switching banks is that it is thought to be tricky to do. Let's have a look at what is involved. Poor customer service - It is often the straw that breaks the camel back. If there is a problem with your account finding a new provider may be the best thing to do. Low interest rates offered by your bank - Interest rates are rock bottom at the moment and current accounts are not designed to be great earners. Some banks do now offer accounts with a decent interest rate and no monthly fee. The TSB Classic Plus account offers 3% interest on balances up to £1,500 if you pay in at least £500 a month and register for online banking and paperless statements and correspondence. No cashback deals - If your account doesn't offer a good interest rate you could earn money through cashback. For a £1 fee each month the Santander 123 Lite Current Account gives cashback on a variety of household bills that are paid out of the account. Again you need to put £500 into the account each month and register for online banking and paper-free account. Opening perk - You may be happy with your current provider but if you switch to another you could be quids in. Many offer a sweetener to bring in new business. Until the 23rd July 2017 HSBC are offering £200 to people who switch to their HSBC Advance Bank Account or HSBC Premier Bank Account. If you stay for a year they will give you another £50. Overdraft charges - If you are someone who regularly goes overdrawn then an account with no or low overdraft fees could save you a lot of money. If you use the First Direct switching service they are offering the first £250 of your overdraft free. You need to deposit at least £1,000 in the first three months of opening the account. - Find which bank and account you want to switch to and make sure you meet all the eligibility conditions. 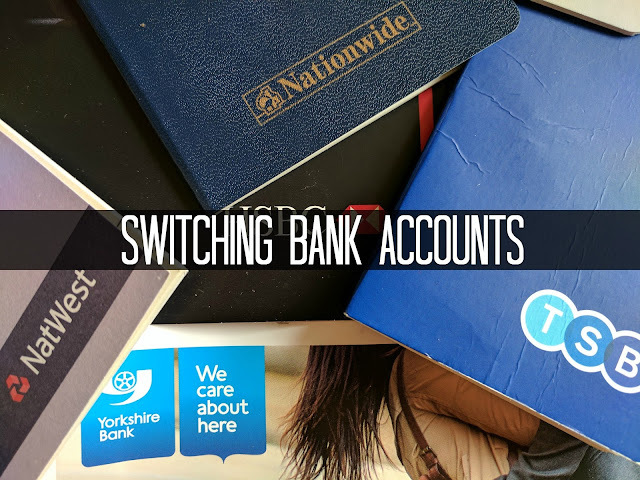 - Under the Current Account Switch Guarantee that was introduced in September 2013 the process should now be automated and go through automatically. If the process goes wrong and it is the fault of the bank they will need to compensate you. - Print off any information you may need from your existing current account such as bank statements. Once you switch you may find you won't be able to access them easily if needed. - Cancel any old payments you no longer need. There's no point in switching them over. - Pick a date to switch. The process takes seven days so pick a date in which you know something vital isn't due such as your salary going in or direct debits going out. It should all happen automatically but don't try to complicate matters. - Your new bank will be responsible for closing your old account and transferring across any balance and any payment orders such as direct debits. - Sit back and reap the benefits of your new bank account! Have you ever switched your bank account? How did you benefit? Account details correct at writing. Please consider your own personal financial circumstances before switching bank accounts. If you want to join in with this week's Finance Fridays then add your link to the linky below. Any post concerning financial matters is allowed. Full details here. It doesn't have to be published today as you have until 23.55 on Tuesday 20th June 2017 to join in.